It's a brave new world for console gamers. With hardware like the New 3DS XL, the New 2DS XL, and the PS4 Pro doing more to update their respective generational platforms than anything else seen this century, truly upgraded hardware means the arms race between console makers is hotter than ever. For the living room, the prevalence of 4K HDR TVs almost seems to demand an upgrade over hardware that debuted back in 2013. And no one is pushing harder and offering more than Microsoft and the Xbox platform. Not happy to merely eclipse the original Xbox One with the slim, stylish, more powerful, HDR and Ultra HD Blu-ray supporting Xbox One S, Microsoft has gone to the extreme with the Xbox One X. To go with the (standard) Xbox One X review kit provided by Microsoft, I used both a Samsung QN65Q7F and LG 65UH7700 for the display, and a Marantz SR6011 for the AVR. A 4TB SATA 6Gb/s 7200rpm Toshiba drive in an Inateck Aluminum USB 3.0 Hard Disk Drive Enclosure was used for game storage. For 1080p testing, a Sony KDL52V5100 and a Denon AVR-S910W were used. The Xbox One X (codenamed Project Scorpio) is the newest console on the scene, and the newest console to join the Xbox One family. 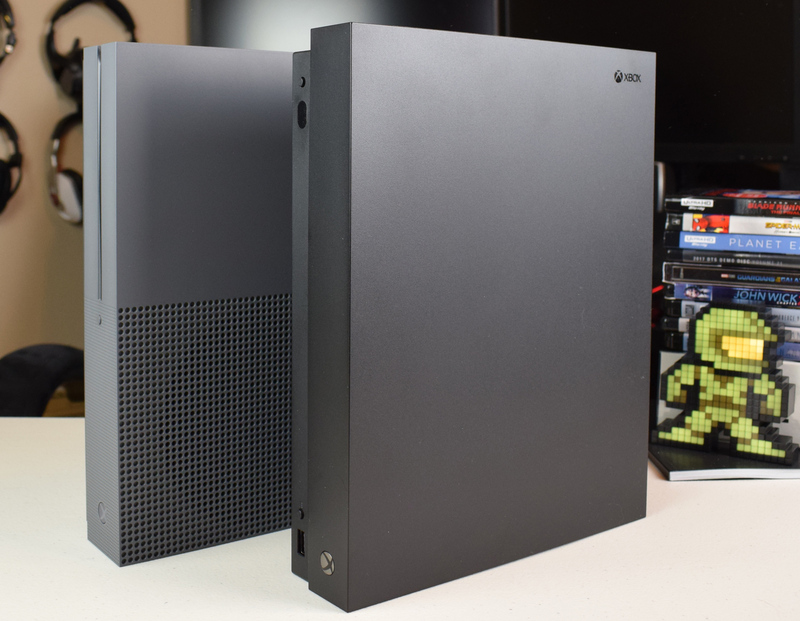 While the Xbox One S has replaced the original Xbox One as the defacto Xbox console, the Xbox One X brings significantly more power to bear at a greater price, but without a larger footprint, and amazingly, the Xbox One X is significantly quieter than the One S. I've already written a wordy comparison of the Xbox One X and Xbox One S (see here), and I'll try not to repeat myself too much here. 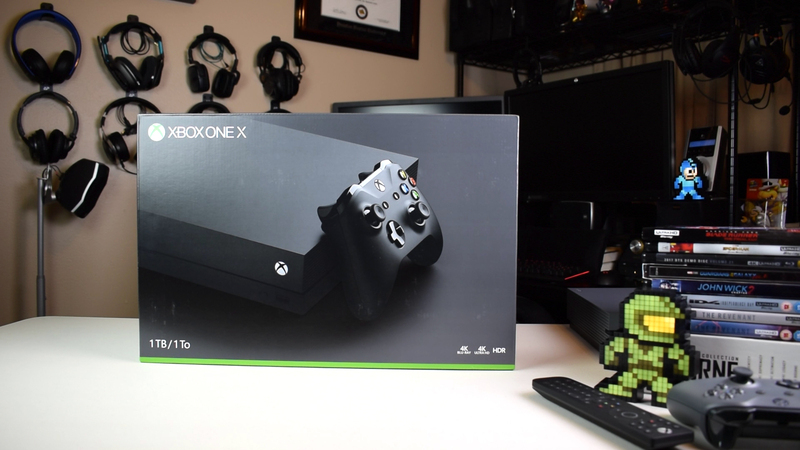 But what may be important for Xbox One users old and new, is that the Xbox One X supports all the games and accessories of the Xbox One family. (Even the Kinect is supported by way of an adapter.) Likewise, brand new games from this year and on in this generation, while likely to bear the "Xbox One X Enhanced" designation and possibly the "4K" and "HDR" designations, will still be playable on the Xbox One S and that original Xbox One. Thus, the Xbox One X is not a new console generation. But frankly, it's the next best thing. 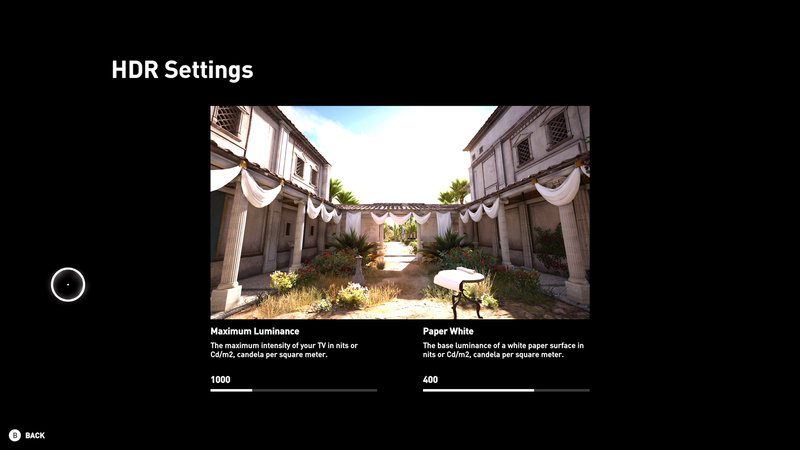 Combining the Xbox One X with a Samsung QLED QN65Q7F in Game Mode means having extremely low input lag while enjoying 4K visuals, HDR, and Dolby Atmos. Here at the launch, per-title support for the Xbox One X is a bit scattershot. The system's extra power and enhanced stability isn't exactly limited, and so in theory and in experience, every game from the Xbox One, backward compatible 360, and original Xbox catalogs benefit from what the Xbox One X can do. And yet, it's hard not look at the Gears of War 4 experience, which entails native 4K (Microsoft calls this "true 4K"), HDR, and Atmos, and want that for every Xbox One game, or at least every new Xbox One game. Fortunately, as the pre-launch period got closer to launch, more and Xbox One X Enhanced patches became available. Such a list includes the likes of game like Assassin's Creed Origins (4K, HDR, Atmos), Call of Duty: WWII (4K, HDR), EA Sports FIFA 18 (4K, HDR), Middle-Earth: Shadow of War (4K, HDR), Super Lucky's Tale (4K, Atmos), and Wolfenstein II: The New Colossus (dynamic 4K). See the full running list here. 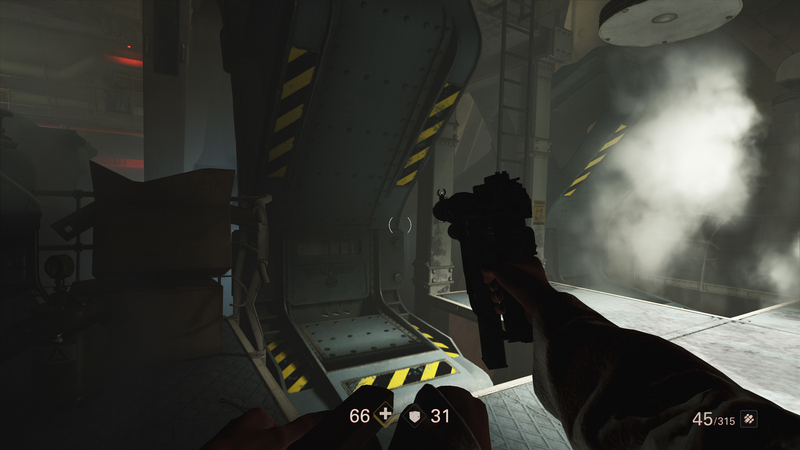 In many cases, the games include an option to emphasize framerate over resolution (or vice versa), which does the give the user a slight degree of welcome control over the experience and follows similar options seen in some PS4 Pro games over the last year. While waiting anxiously for promised Xbox One X patches comes as part of the pre-release review game, the idea with the Xbox One X's massive jump in power of its predecessors is to offer the best in per-title performance and features with a minimum of fiddling by the user. The Xbox One X joins the Xbox One S as the only two consoles on the market (or even announced) to include a 4K Ultra HD Blu-ray drive, and unlike some UHD Blu-ray players, streaming apps haven't been forgotten. Among the many apps offered, Amazon, Netflix, and Vudu support 4K HDR10 content, and the latter two apps support the still elusive Dolby Digital+ Atmos audio. In case anyone is still wondering, 4K HDR content is on the rise, and there is no slowdown in sight. The Xbox One X, by virtue of its growing Xbox One Enhanced title list, its included Ultra HD Blu-ray support, and its more robust streaming apps, appears to be the strongest 4K HDR TV companion yet. I recently put in a lot of hours over a lot of Ultra HD Blu-ray titles in an attempt to trip up the Xbox One S. (See here.) Like the Xbox One S, the Xbox One X is surprisingly good at Ultra HD Blu-ray playback. Watching the tricky to find Blade Runner: The Final Cut on 4K Ultra HD Blu-ray on the Xbox One X and seeing the future noir of Los Angeles in 2019, there is nothing about the Xbox One X to fault. The more stunning than stunning transfer is on full display, and that Atmos track comes right to the AVR without any hint of an issue. The One X is snappier and smoother in app deployment than the One S, and One X appears to effortlessly indicate that it may be time to retire the Samsung UBD-8500. I have no doubt that the Xbox One X is, as modern consoles go, quieter than standard. Firing up Spider-Man: Homecoming means, of course, remembering that the Xbox One X is HDR10 only, but again the Atmos (and DTS:X) support that had been missing for so long from the Xbox platform is now here in full force. Meanwhile, the Planet Earth II discs have no trouble proving why Microsoft chose this set to be in their Xbox One X review kit. (I consider this set to be in a strata above demo material.) Where things stumbled a bit, though, funnily enough, was when I popped in the first disc of my ten-year old Planet Earth Blu-ray and couldn't even get to the menu screen after multiple attempts. Make no mistake, I had tried many regular Blu-rays on the Xbox One S (including BD-Rs) without this kind of trouble. But before I could get too upset at this issue, I noticed that the Blu-ray app needed an update. After updating, the same Planet Earth disc that had been refusing to play correctly, worked fine. One aspect about the Xbox One X to note for the home theater is that, like the One S before, the Xbox One X only has one HDMI out. So anyone with a new TV, but on older HDMI 1.4b AVR will have to make some tough decisions about set-up and possibly upgrading. That's something standalone players avoid by having a second HDMI out. In the 4K HDR world it's easy to overlook one very important usage scenario for the Xbox One X, and that's how it handles output to a 1080p display. As some users are holding off upgrading their displays for one reason or another, and in some cases, prefer to stick to 1080p, it's wise that Microsoft didn't limit the Xbox One X capabilities to only certain displays. 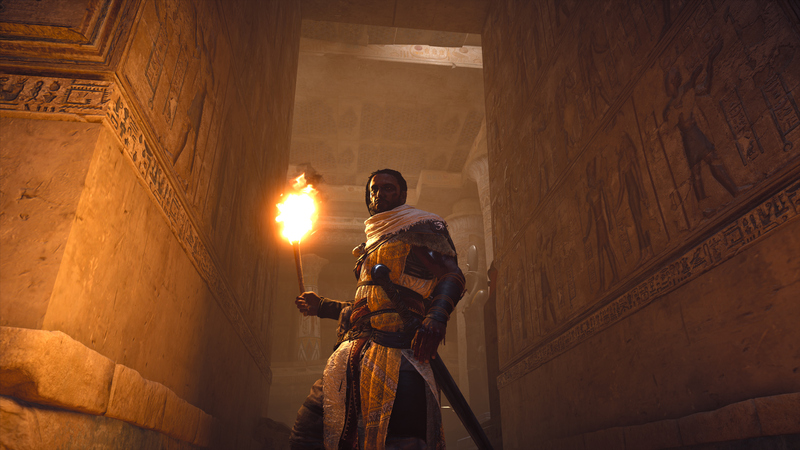 It's not merely that the Xbox One X remains spry and quiet when used with a HD screen, or that it's still possible to play Ultra HD Blu-ray discs minus the 2160p HDR features, but with games, the Xbox One X not only helps to deliver stable performance beyond what the original Xbox One could do, but also takes advantage of supersampling. 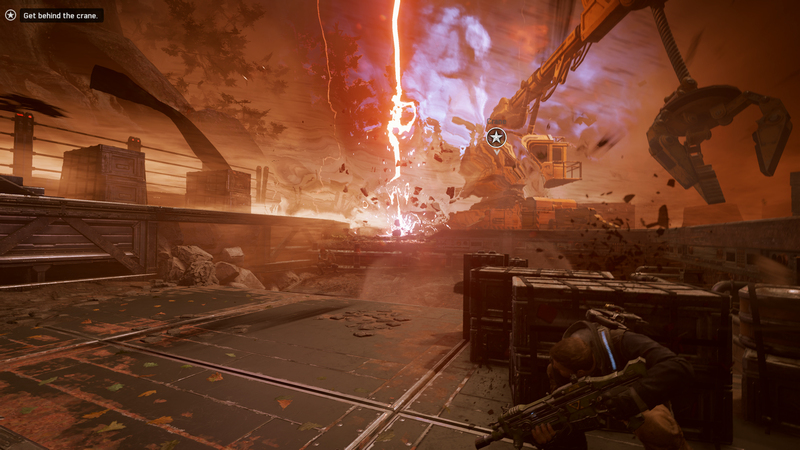 With Xbox One X Enhanced titles, the system takes the higher resolution output (like Gears of War 4's native 4K) and scales it down to 1080p. 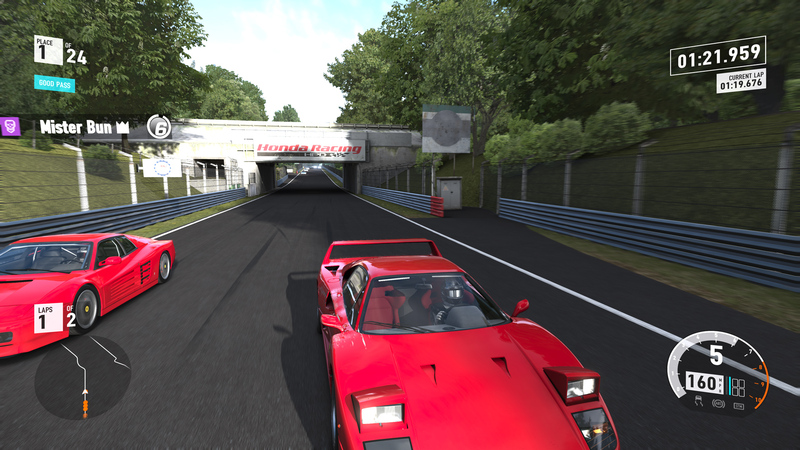 In practice what I noticed most (aside from a softer, HDR less overall look) was an increased texture detail to go with a more stable framerate. 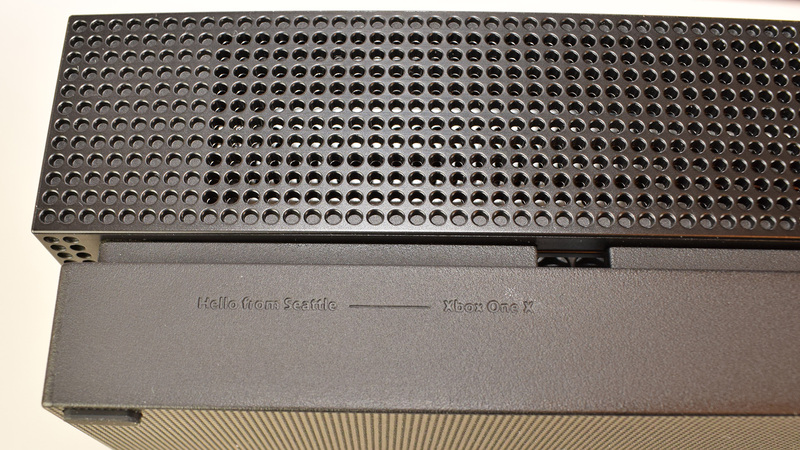 Compared with an original Xbox One, aliasing is less of an issue, which simultaneously means less artifacts and, depending on the user's expectation, some softer edges here and there. Considering that older games like Fallout 3 and Halo 3 have been given the Xbox One X Enhanced treatment, there is the case to be made that the Xbox One X is a real boon for the 1080p user. 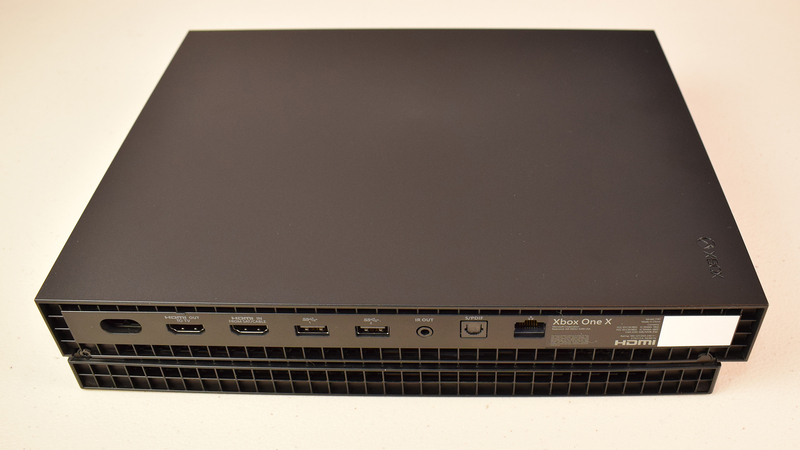 There are some Xbox One X features that I left untouched, including the IR Blaster and HDMI in. 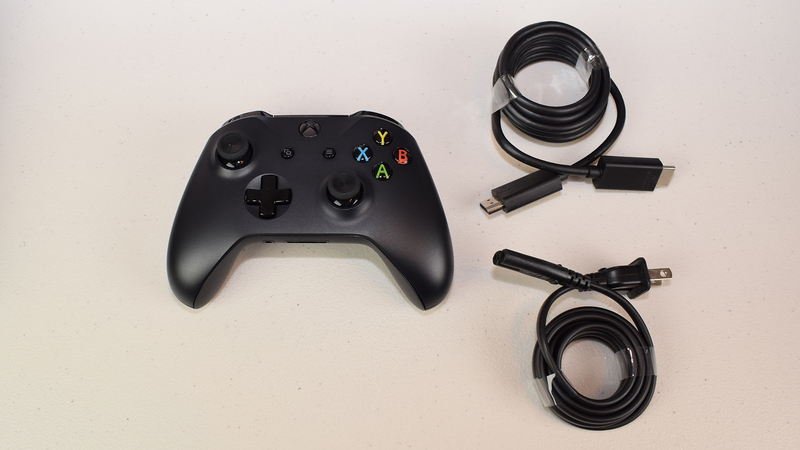 Like the Kinect module, these items just don't rate as worth checking out. On the other hand, one feature I wasn't able to check out interests me greatly. That would be the variable refresh rate. 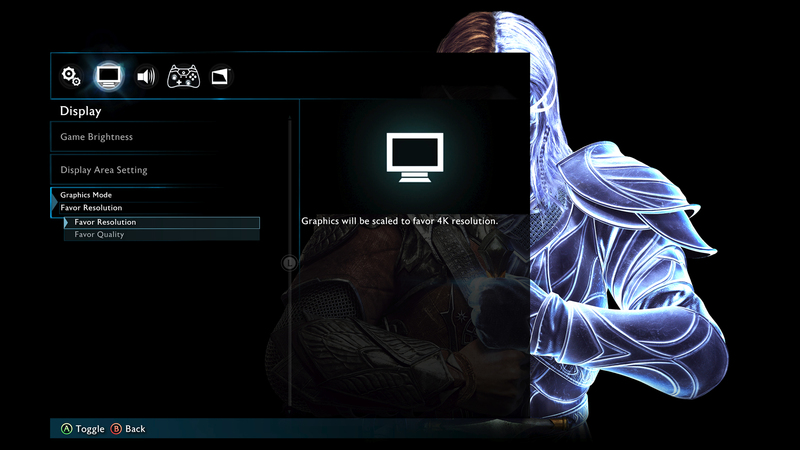 Eliminating screen-tearing via hardware sync rather than a performance-dampening rendering restriction is an impressive innovation in the PC space. I'm still surprised that Microsoft managed to get it into the Xbox One X's hardware spec, and I look forward to seeing support on the display side in the living room. The UI for the Xbox One has clawed its way into a superior state, most recently with the Fall Update, and much like Atmos for gaming and streaming apps, seems best when on the Xbox One X. There nevertheless remain a few annoyances. The Xbox One X is capable of capturing and streaming in 4K HDR, but dealing with captures on the device is clunky. Sharing is linked to Xbox Live and Onedrive. Similarly, the help system is there to remind the user that having separate apps for certain features doesn't always work the best. These are nitpicks, to be sure, but hopefully, the platform team will continue their work and sort them out. Still, unlike the homely, 4K Ultra HD Blu-ray-lacking PS4 Pro, the Xbox One X reflects a no-compromise, no-corners cut design. It looks greats on paper, in person, and in use. If Microsoft were to add Dolby Vision support in a manner similar to how Dolby Atmos was added, there wouldn't be anything about the hardware left to address. After working to correct some questionable choices with the original Xbox One, Microsoft and Xbox are back on the cutting edge. The Xbox One X not only surpasses the Xbox One S is every way, but out-powers, out-sexes, and out-features the cheaper PS4 Pro. 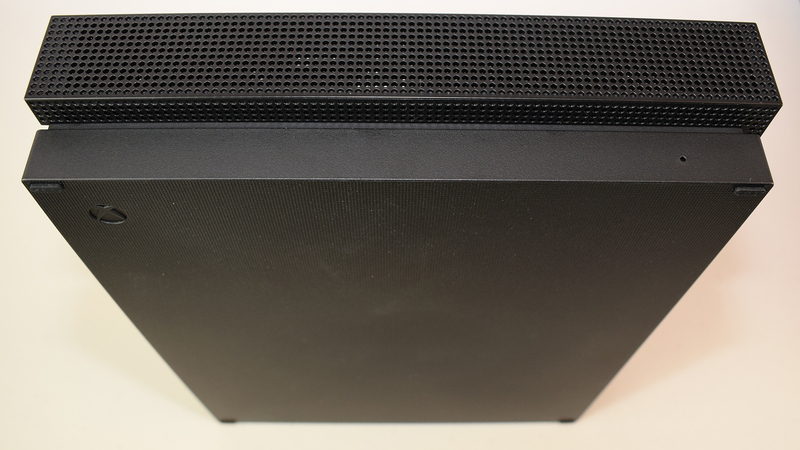 It's a sleek package that manages select native 4K HDR gaming, Ultra HD Blu-ray playback, Dolby Atmos for gaming, and has a growing catalog spanning some 15-plus years. Anyone looking into serious gaming and multimedia to go along with a 4K HDR TV need look no further (unless they require Dolby Vision).